Are We Alone, Are We In Control? Are we alone? Unfortunately, neither of the answers feel satisfactory. To be alone in this vast universe is a lonely prospect. On the other hand, if we are not alone and there is someone or something very powerful or more intelligentsia out there, that too is terrifying. According to NASA's recent research and discussions of NASA Contact Conference, which focused on serious speculations about other dimensions of existence and extraterrestrials. The concerned participant said loudly in a sinister tone, "You have absolutely no idea what is out there!" The silence was palpable as the truth of this statement sunk in. 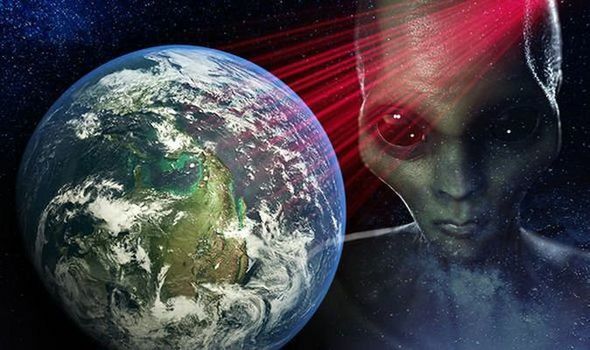 Humans are fearful of extraterrestrials visiting Earth. Perhaps fortunately, the distances between the stars are prohibitively vast. At least this is what makes us as novices, who are just learning to travel into space, and then tell ourselves we are the center of the universe. I have always been interested in UFOs, especially myself. Of course, there was the excitement that there could be aliens and other living worlds. But more exciting to me was the possibility that interstellar travel was technologically achievable. In 1988, students at Montana State University were discussing a recent cattle mutilation that was associated with UFOs. A physics professor joined the conversation and told them that he had colleagues working at Malmstrom Air Force Base in Great Falls, Montana, where they were having problems with UFOs shutting down nuclear missiles. At the time they thought this professor was talking nonsense. But 20 years later, some students were stunned to see a recorded documentary from a press conference featuring several ex-US Air Force personnel, with a couple from Malmstrom AFB, describing similar occurrences in the 1960s. Clearly, there must be something to this. With July 2 being World UFO Day, it is a good time for society to address the unsettling and refreshing fact we may not be alone. I believe we need to face the possibility that some of the strange flying objects that outperform the best aircraft in our inventory and defy explanation may indeed be visitors from afar – and there's plenty of evidence to support UFO sightings. The Fermi paradox The nuclear physicist Enrico Fermi was famous for posing thought-provoking questions. In 1950, at Los Alamos National Laboratory after discussing UFOs over lunch, Fermi asked, "Where is everybody?" He estimated there were about 300 billion stars in the galaxy, many of the billions of years older than the sun, with a large percentage of them likely to host habitable planets. Even if intelligent life developed on a very small percentage of these planets, then there should be a number of intelligent civilizations in the galaxy. Depending on the assumptions, one should expect anywhere from tens to tens of thousands of civilisations. With the rocket-based technologies that we have developed for space travel, it would take between 5 and 50 million years for a civilisation like ours to colonise our Milky Way galaxy. Since this should have happened several times already in the history of our galaxy, one should wonder where is the evidence of these civilisations? This discrepancy between the expectation that there should be evidence of alien civilisations or visitations and the presumption that no visitations have been observed has been dubbed the Fermi Paradox. Carl Sagan correctly summarised the situation by saying that "extraordinary claims require extraordinary evidence." The problem is that there has been no single well-documented UFO encounter that would alone qualify as the smoking gun. The situation is exacerbated by the fact that many governments around the world have covered up and classified information about such encounters. But there are enough scraps of evidence that suggest that the problem needs to be open to scientific study. When it comes to science, the scientific method requires hypotheses to be testable so that inferences can be verified. UFO encounters are neither controllable nor repeatable, which makes their studies and experiences extremely challenging. But the real problem, in my view, is that the UFO topic is regarded as a taboo. While the general public has been fascinated with UFOs for decades, our governments, scientists and media, have essentially declared that of all the UFO sightings are a result of weather phenomenon or human actions. None are actually extraterrestrial spacecraft. And no aliens have visited Earth. Essentially, we are told that the topic is nonsense. UFOs are off-limits to serious scientific study and rational discussion, which unfortunately leaves the topic in the domain of fringe and pseudoscience like ufologists, many of whom litter the field with conspiracy theories and wild speculation. I think UFO scepticism has become something of a religion with a political agenda, discounting the possibility of extraterrestrials without scientific evidence, while often providing silly hypotheses describing only one or two aspects of a UFO encounter reinforcing the popular belief that there is a conspiracy. A scientist must consider all of the possible hypotheses that explain all of the data, and since little is known, the extraterrestrial hypothesis cannot yet be ruled out. In the end, the sceptics often do science a disservice by providing a poor example of how science is to be conducted. The fact is that many of these encounters – still a very small percentage of the total – defy conventional explanation. The media amplifies the skepticism by publishing information about UFOs when it is exciting, but always with a mocking or whimsical tone and reassuring the public that it can't possibly be true. But there are credible witnesses and encounters. Why astronomers don't see UFOs? I am often asked by friends and colleagues, "Why astronomers not seeing UFOs?" The fact is that they do. In 1977, Peter Sturrock, a professor of space science and astrophysics at Stanford University, mailed 2,611 questionnaires about UFO sightings to members of the American Astronomical Society. He received 1,356 responses from which 62 astronomers – 4.6 percent – reported witnessing or recording inexplicable aerial phenomena. This rate is similar to the approximately 5 percent of UFO sightings that are never explained. As expected, Sturrock found that astronomers who witnessed UFOs were more likely to be night sky observers. Over 80 percent of Sturrock's respondents were willing to study the UFO phenomenon if there was a way to do so. More than half of them felt that the topic deserves to be studied versus 20 percent who felt that it should not. The survey also revealed that younger scientists were more likely to support the study of UFOs. UFOs have been observed through telescopes. I know of one telescope sighting by an experienced amateur astronomer in which he observed an object shaped like a guitar pick moving through the telescope's field of view. Further sightings are documented in the book "Wonders in the Sky," in which the authors compile numerous observations of unexplained aerial phenomena made by astronomers and published in scientific journals throughout the 1700s and 1800s. Evidence from government and military officers Some of the most convincing observations have come from government officials. In 1997, the Chilean government formed the organization Comité de Estudios de Fenómenos Aéreos Anómalos, or CEFAA, to study UFOs. Last year, CEFAA released footage of a UFO taken with a helicopter-mounted Wescam infrared camera. The countries of Brazil, Canada, Denmark, Ecuador, France, New Zealand, Russia, Sweden and the United Kingdom have been declassifying their UFO files since 2008. The French Committee for In-Depth Studies, or COMETA, was an unofficial UFO study group comprised of high-ranking scientists and military officials that studied UFOs in the late 1990s. They released the COMETA Report, which summarized their findings. They concluded that 5 percent of the encounters were reliable yet inexplicable: The best hypothesis available was that the observed craft was extraterrestrial. They also accused the United States of covering up evidence of UFOs. Iran has been concerned about spherical UFOs observed near nuclear power facilities that they call "CIA drones" which reportedly are about 30 feet in diameter, can achieve speeds up to Mach 10, and can leave the atmosphere. Such speeds are on par with the fastest experimental aircraft, but unthinkable for a sphere without lift surfaces or an obvious propulsion mechanism. In December 2017, The New York Times broke a story about the classified Advanced Aviation Threat Identification Program, which was a $22 million program run by the former Pentagon official Luis Elizondo and aimed at studying UFOs. Elizondo resigned from running the program protesting extreme secrecy and the lack of funding and support. Following his resignation Elizondo, along with several others from the defense and intelligence community, were recruited by the To the Stars Academy of Arts & Science, which was recently founded by Tom DeLonge to study UFOs and interstellar travel. In conjunction with the launch of the academy, the Pentagon declassified and released three videos of UFO encounters taken with forwarding looking infrared cameras mounted on F-18 fighter jets. While there is much excitement about such disclosures, I am reminded of a quote from Retired Army Colonel John Alexander: "Disclosure has happened. … I've got stacks of generals, including Soviet generals, who've come out and said UFOs are real. My point is, how many times do senior officials need to come forward and say that this is real?" There is a great deal of evidence that a small percentage of these UFO sightings are unidentified structured craft exhibiting flight capabilities beyond any known human technology. While there is no single case for which there exists evidence that would stand up to scientific rigor, there are cases with simultaneous observations by multiple reliable witnesses, along with radar returns and photographic evidence revealing patterns of activity that are compelling. Declassified information from covert studies is interesting, but not scientifically helpful. This is a topic worthy of open scientific inquiry, until there is a scientific consensus based on evidence rather than prior expectation or belief. If there are indeed extraterrestrial craft visiting Earth, it would greatly benefit us to know about them, their nature and their intent. Moreover, this would present a great opportunity for mankind, promising to expand and advance our knowledge and technology, as well as reshaping our understanding of our place in the universe.